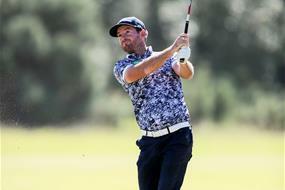 Josh Geary has blitzed the field at the 10th Autex Muriwai Open to shoot the tournaments lowest round of seven-under 65 and close the gap on Gareth Paddison who is a step closer to three-in-a-row at the Muriwai Golf Links. The recent Akarana Open champion was a man on the mission and after starting the day a whopping eight shots behind the dominant Paddison, he is now just two back and looking dangerous. A prize that grabs players attention is the Asahi 52 dozen for lowest round of the tournament and if the wind remains high tomorrow, Geary’s round today will be hard to beat. “It’s funny that the value of a few beers is so big and I will be gunning for that again tomorrow instead of all the prize money,” laughed Geary. However, we all know his focus will be fighting for back-to-back Jennian Homes Charles Tour victories as he smiled about the opportunity to knock Paddison off his perch while playing so well. The concerning sign for the rest of the field is that Paddison still managed a good round of two-under par which included two double-bogies along the way to his tournament total of 12-under. He seems at home here at the Muriwai Golf Links and his birdie count hasn’t looked like slowing down all week as he eyes yet another title out west and his sixth victory overall on the Jennian Homes Charles Tour. He will be joined in the final group by Geary and James Anstiss who continues his consistent run on the national circuit after featuring in the final pairings for three consecutive events. Daniel Hillier joins Anstiss at six-under par with Tyler Wood, Dongwoo Kang and Kerry Mountcastle a further shot back at five-under for the week. It’s mate versus mate in the women’s field with Caryn Khoo and Brittney Dryland pulling clear of the crowd with superb rounds of two and three-under respectively. Khoo will start the all-Auckland shootout with a two-shot lead over Dryland as they both search for their first win at the Autex Muriwai Open. The rest of the field is a further six-shots behind Dryland and the pair are excited to see what happens on the links tomorrow. “It’s going to be a fun day, we play quite a lot of golf together but not like this, so it will be fun to try hold Brittney off,” smiled Khoo. After winning the Akarana Open last week, Khoo’s confidence is high ahead of the final day. Dryland who continues to improve every day laughed about the shootout but naturally can’t wait. “It’s going to be fun, Caryn doesn’t talk much on the course anyway, so there won’t be much sledging and we will have to wait and see who comes out on top. Either way we will be happy,” beamed Dryland. The players will enjoy a sleep-in tomorrow with the final round of the New Zealand summer getting underway at 8:30am.